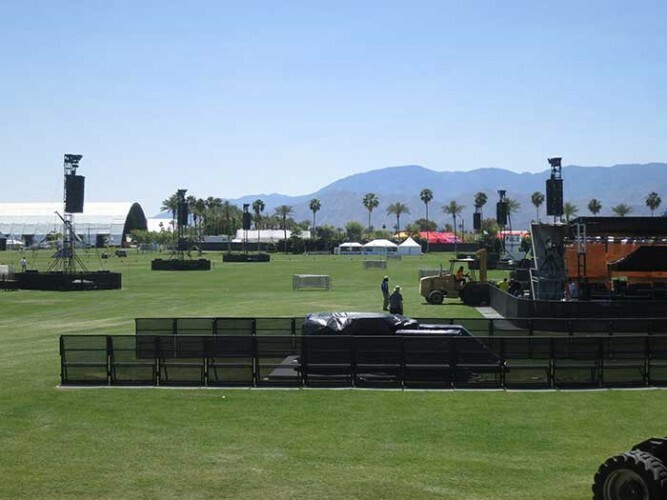 USA – Rat Sound, a leading sound reinforcement specialist for the concert touring industry, integrated a Dante audio network from Audinate at this spring’s Coachella Valley Music and Arts Festival and consequent Stagecoach festival. Faced with the challenge of covering enormous areas of roughly 750 x 1200 feet, Rat Sound simplified the installation by installing a Dante network to ensure robust and reliable carriage of high-quality audio across 21 delay positions. In addition to reducing the labour installation costs, the Dante audio over IP solution provided exceptional performance at the renowned music festival. The annual festival featured over 200 artists and attracts several hundred thousand fans to the desert climate of Indio, California over two subsequent weekends every April. For Coachella, the 21 delay positions were divided between the main Coachella festival stage and the nearby Outdoor Theatre Stage, with Dante-enabled Yamaha digital mixing engines and Lake LM44 digital audio processors supporting the digital audio architecture. The network delivered three channels of audio – left, right and VIP – over Cat5 cable, which the Rat Sound team terminated on site to simplify the overall cabling infrastructure between various sound towers. According to Tom Worley, full-time systems engineer and front-of-house technician for Coachella, Rat Sound has used Dante for three-years running as it’s proven to be both reliable and versatile for networked audio across large spaces. The Rat Sound configuration included festival and guest consoles, each matrixed at front of house via two Yamaha DME64N digital mixing engines. The DME64Ns routed AES, analogue and Dante outputs to more than 24 destinations, while integrated MY16-AUD Dante cards generated the primary and secondary audio path for optimal redundancy. Rat Sound added an off-the-shelf, managed switch at the centre of each delay ring to network the Dante audio and amplifier control system. The Lake LM44 processor converted the Dante audio to AES for delivery to the delay amplifiers, with a daisy-chained architecture between all delay rings and additional destination points. Worley adds that Dante’s simplified deployment and ongoing of use thanks to a nearly effortless integration process, with flexible reconfiguration of network parameters as needed.